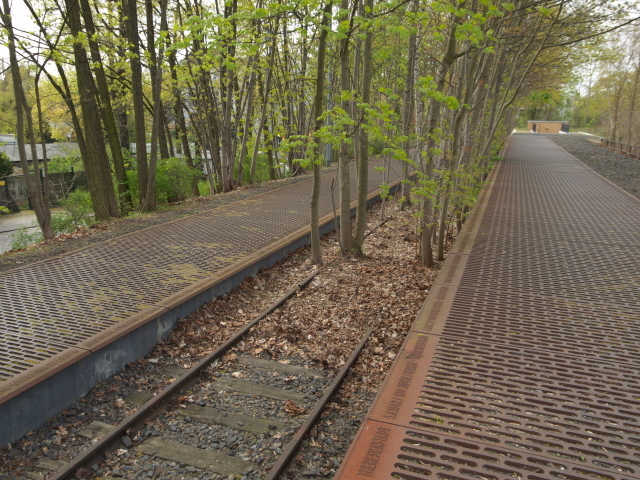 An unusual monument commemorating the deportation of Jews during the Holocaust from a remote train station in the south-west of Berlin in the Grunewald district. More background info: As the Holocaust was gathering momentum during the Third Reich, especially from 1942 onwards in the so-called “Final Solution” (see also Operation Reinhard and House of the Wannsee Conference), this location was chosen to “dispatch” the rounded-up Jews of Berlin who were then deported to the East, mostly to Theresienstadt and ghettos and concentration camps in Poland and beyond. 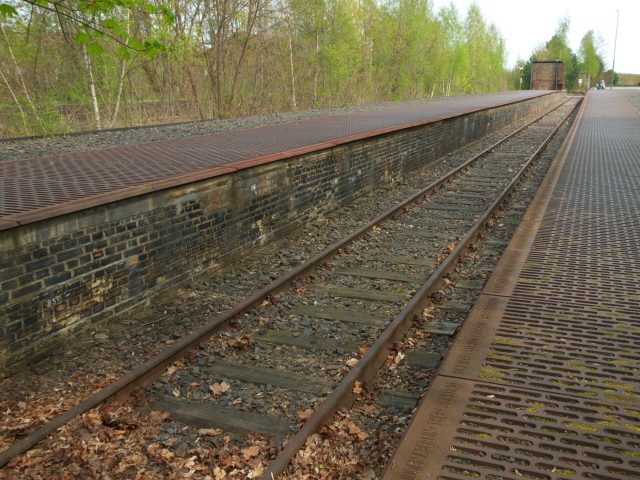 Remote Grunewald station in the sparsely populated outskirts of the city was chosen because here the long queues of Jews lining up on the ramp towards the platforms would not be so publicly visible. And protests from the nearby posh district of villas of well-to-do Berliners were deemed (correctly) less likely. After WWII, Grunewald station lost much of its logistical importance as a train station. Parts of it are still in use by the German railways (DB), others are derelict. Only the S-Bahn (regional metro train) station Grunewald remains active for passenger transport. The main memorial at the now disused track 17 was inaugurated in 1998. It complements a couple of earlier memorials not directly at the track but on the ramp and the square in front of the eastern entrance to the station that date from 1991 and 1987, respectively. 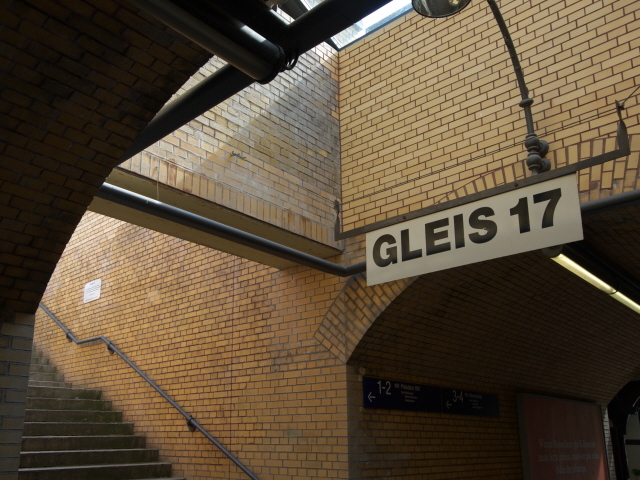 German “Gleis” literally means 'track', but the actual (main) memorial is on the platforms on both sides of this track, which is why I use as English equivalents to “Gleis 17” both 'Track 17' and 'Platform 17' interchangeably here. What there is to see: From the active part of the station, i.e. the S-Bahn (regional metro train) station you have to head towards the eastern exit along the tunnel under the tracks. Just before the exit, you can take the last set of stairs up to the platform level to get straight to today's main memorial. It is clearly marked “Gleis 17”. On the wall up these steps you can spot a small plaque in memory of the deportation trains sponsored by Deutsche Bahn. Up on the platform you have to walk a little to the north to come to the main memorial proper. This consists of two metal platforms on the edge of the old platforms either side of the half-overgrown old rail tracks. Trees grow here. A bit further away, these have been cleared. You can cross over to the other side to the lower-lying eastern side at both ends of this stretch of track. The metal platforms are made of iron grates and on the edge of each of them you'll find short inscriptions marking the various transports that departed from here. Given are the date of the transport, the number of Jews on board and the destination the trains were headed for from Berlin. At the end of the platform/track there's another plaque with an inscription in Hebrew and German with another general note of commemoration of the transports. Beyond this point the derelict parts of the former station are nominally off limits to the public, though it wouldn't be difficult to go trespassing here – there is only a small warning sign in the middle of the track, but no barrier. Other than by the steps from the tunnel, you can also access the platforms from the street level outside the eastern side of the station. Along this ramp there's another large monument, the work of a Polish artist dating from 1991. It consists mainly of a plain concrete wall into which hollows of roughly human shape are set. At the bottom end of the ramp stands a tall metal panel into which another dedication is etched. 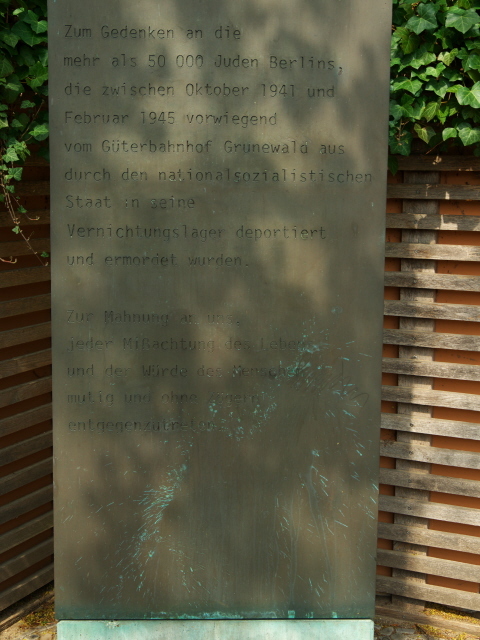 This gives a few figures too: “In memory of the more than 50,000 Berlin Jews who were deported between October 1941 and February 1945 mainly from the Grunewald freight station by the National Socialist State to its extermination camps and murdered there”. In the square outside the eastern station building there is another memorial. This is in fact a replica of the oldest of all the Grunewald station commemoration attempts, namely by a local women's association of the Protestant church. It was set up in 1987. In its present form it consists of a triangular area filled with gravel, out of which a few young birch trees are growing (clearly a more recent addition) and a few sets of upright stones. On the eastern side is an arrangement of a wooden sleeper with a small memorial plaque. On the memorial the date of the first transport, 18 October 1941, is stated. Finally, opposite this memorial and the square stands what once used to be a telephone kiosk. Now it is a “BücherboXX”, or 'book box'. This is practically a small “honesty library” where you can borrow books from a cabinet inside. One shelf has books specifically on the topic of the Grunewald Gleis 17 memorial. Whether all this is worth the trek out to this far-out location will depend on two things: a) your specialist interest in the Holocaust and all its authentic sites, even the less high-profile ones, and b) whether you'd be interested in visiting Teufelsberg too. Because if so, then Gleis17 makes a perfect combination. 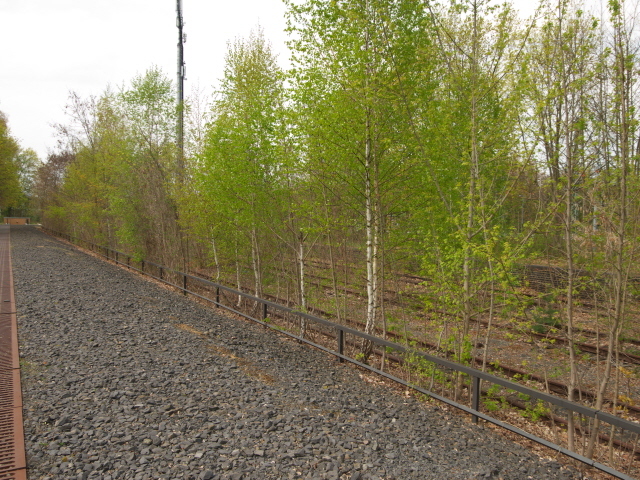 Location: on the north-eastern edge of Grunewald station, in the Berlin district of the same name in the south-west of the city. Details: The location may be a long way from the centre of Berlin but the regional metro train (S-Bahn) line S7 makes it very easy to get here. It is actually just seven stops from Hauptbahnhof (main station) right in the heart of Berlin. At the station head for the eastern exit along the tunnel under the tracks (i.e. in the opposite direct to where most day-trippers will be going: Grunewald forest itself) and follow the signs for “Gleis 17”. You can avoid the steps directly from the tunnel by carrying out to the outside of the station and turning left to use the ramp. The monument and memorials are freely accessible at all times (but only during daylight hours makes sense). Time required: between about 10 minutes and half an hour max. Combinations with other dark destinations: Grunewald station is also one of the possible points from where to embark on the hike to the top of Teufelsberg. This is the combination I opted for when I finally made it to these two sites in May 2016. If the weather is fine, it's perfect. I wouldn't pick a rainy day for this, though. Another suitable combination, both in terms of transport logistics as well as (especially) in terms of being thematically linked to the deportations is the House of the Wannsee Conference, where the implementation of the “Final Solution” was discussed by top-brass Nazis. If you've made the pilgrimage to “Gleis 17”, then a visit to the historical Wannsee Conference site is almost obligatory. The S7 regional metro trains make it easy to get to Wannsee station, but from there it's a bit of a hike (or a ride on an infrequent bus). Furthermore, the S7 regional metro train line also can take you all the way to its terminus at Potsdam in Brandenburg, which also features a number of sites of interest to the dark tourist. Combinations with non-dark destinations: The main reason why Berliners from other districts and visiting tourists come to Grunewald is the huge forested recreational area of that same name that stretches out for miles to the west of the station. It is indeed Berlin's largest green area. The waterfront on the Havel and Wannsee to the west of the forest even feature a beach club and pleasure boat trips. On the other side of the station you will already see some of the grand villas of the posh residential part of the Grunewald district. These may be worth a little wander further into the district too. Otherwise head back to the centre of Berlin – or continue in the other direction all the way to Potsdam (the terminus of the S7 regional metro train line).